Hopefully someone here has some opinion, valid or not, on how to fish haddock from a party boat this time of year. I usually get out once or twice a year but it is much earlier in the season, as I understand it the dogfish get worse as the water warms. 1) Should I eschew bait and jig or stick with bait and deal with the dogs? 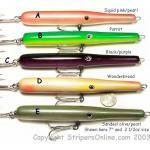 2) What is the smaller end of jigs that would work without getting hung up with other people fishing bait. I tend to fish the pulpit. Also, free bonus, I do well with circle hooks bait fishing on the bottom, anyone else do well? Party boats are tough. Best method is going to depend on a number of factors, ie, current, wind, dogfish, etc... I always prefer to jig a 9oz jig but this time of year your likely hitting depths of 150-200ft deep and holding bottom is key so weight varies depending on drift. As for not getting hung up with others it's usually the jigs that F everything up on a party boat. They tend to spiral down where bait rigs drop more direct but you deal with more dogs. I am inclined to agree, so i think the play is use whatever i have rigged up and if it's not putting fish in the boat switch it up. Doggies prefer cooler water, shouldn't be a problem unless your fishing really deep. We did a haddock charter the other day and killed it. Fish on almost every drop. Just as many throwbacks as legal fish. We had almost an entire 5 gallon bucket filled with haddock fillets by the end of the day. Lots of 10-15lb cod in the mix that had to be released. Not one dogfish. Few redfish and good sized pollock. I like a reel that is 4:1 or higher for haddock. We use 6.4:1 gear ratio. They aren't huge fish but they kick a lot on the way up. Helps keep the line slack free. Definitely spool up with braid, anywhere from 50lb to 80lb. 50lb - 80lb mono leader. 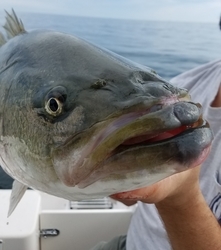 Groundfish aren't line shy; fluorocarbon isn't necessary. The heavier leader is better for tying dropper loops and is important if you are lucky enough to hook into something big like a halibut or bluefin. I like to do a wind on leader two fathoms long. A couple of 4/0 or 5/0 hooks on dropper loops. Double surgeons loop knot on the end for the sinker. We use anywhere from a 6oz to 20oz depending on current, wind, the tide, drift vs anchor, etc. A few 10oz, 14oz, and 16oz should be ideal for most situations though. You can add teasers to the hooks if you like. Either small grubtails or tubes. Clam seems to be the most productive bait for haddock. Jigs will catch them too but in my experience, you'll hook more codfish.